"The Spoils of War" is the fourth episode of the seventh season of HBO's fantasy television series Game of Thrones, and the 64th overall. It was written by series co-creators David Benioff and D. B. Weiss, and directed by Matt Shakman. At Dragonstone, Daenerys Targaryen and Jon Snow observe cave drawings left by the Children of the Forest, indicating that the First Men and the Children fought together against the White Walkers. In King's Landing, Cersei Lannister seeks further investment from the Iron Bank, after reassuring them that their debt will soon be paid. In the North, Arya Stark returns to Winterfell, reunites with her siblings, Sansa and Bran Stark, and spars with Brienne of Tarth. On the road to King's Landing, Jaime Lannister, Bronn, and the Lannister and Tarly armies are caught in an attack led by Daenerys, her dragon Drogon, and the Dothraki army. The title of the episode refers to the Tyrell gold and other resources in possession of the Lannisters after taking Highgarden. "The Spoils of War" received praise from critics with one critic defining it as a "masterpiece", who listed the concluding battle sequence between Daenerys and Jaime, Arya's return to Winterfell and interaction with Brienne, and Daenerys and Jon's conversation at Dragonstone as highlights of the episode. It received a nomination at the 70th Primetime Emmy Awards for Outstanding Editing, and was also Nikolaj Coster-Waldau's pick to support his nomination for Outstanding Supporting Actor, his first ever for this series. Cersei assures Tycho that the Crown's debts to the Iron Bank will be fully repaid. They discuss the possibility of a new loan that would enable Qyburn to engage the mercenary Golden Company of Essos. Littlefinger gives Bran the Valyrian steel dagger that was used in the attempt on Bran's life. Littlefinger tries to get Bran to tell him of his experiences after fleeing Winterfell, and is disconcerted when Bran repeats to him Littlefinger's earlier remark to Varys that "chaos is a ladder." Meera visits Bran to say farewell, as she wants to be with her family when the White Walkers attack. Bran is indifferent to her departure, and a dismayed Meera remarks figuratively that Bran died in the Three-Eyed Raven's cave. Arya arrives at Winterfell, and evades the guards to visit Ned's tomb in the crypts, where Sansa finds her. Sansa takes Arya to see Bran in the godswood. Arya is taken aback to find that Bran knows of her kill list, and Bran gives her the Valyrian steel dagger. Podrick reassures Brienne that she has fulfilled her oath to Catelyn; Brienne insists she did almost nothing. Later, Brienne and Podrick spar and Arya asks to train with Brienne. They fight to a draw as Sansa and Littlefinger watch. Jon shows Daenerys the vast dragonglass mine, in which Children of the Forest cave drawings depict the Children and the First Men fighting together against the White Walkers. Seemingly convinced that Jon is telling the truth, Daenerys vows to fight for the North, but only if Jon bends the knee. Jon remains resistant. Tyrion and Varys report the pyrrhic victory at Casterly Rock and the loss of Highgarden; Daenerys questions Tyrion's loyalties. Considering striking King's Landing with her dragons, she asks Jon for advice. He notes that her followers believe she can change the world, but if she destroys a city, she will be just another tyrant. Later, the Ironborn survivors return to Dragonstone. Jon confronts Theon, declaring that his role in saving Sansa from Ramsay is the only reason he will not kill him for betraying Robb. Theon reveals that he has come for Daenerys' help in rescuing Yara, but Jon and Davos inform him that she has gone. The bulk of the Lannister caravan approaches King's Landing after the Tyrell gold has been brought inside the city. Jaime gives Bronn a large satchel of gold, but Bronn still wants the castle he was promised. Riding Drogon, Daenerys leads a Dothraki attack that quickly overruns the caravan. Abandoning the gold where he drops it, Bronn wounds Drogon with Qyburn's scorpion. Drogon destroys the scorpion, then lands. Tyrion watches the chaos with remorse from a safe distance; as Daenerys dismounts to tend Drogon's wound, Tyrion is shocked to see Jaime charge at her. Drogon breathes fire at Jaime, but Bronn tackles him off his horse, out of the flame's path, and into the Blackwater Rush, where Jaime begins to sink under the weight of his armor. 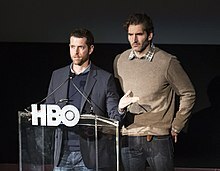 The episode was written by series co-creators David Benioff and D. B. Weiss. "The Spoils of War" was written by the series' creators David Benioff and D. B. Weiss. The episode is the series' shortest episode to date. In the "Inside the Episode" featurette published by HBO following the airing of the episode, David Benioff spoke about the inspiration for the return of Arya Stark to Winterfell, saying it was inspired by Odysseus' return, who is also unrecognizable after making his journey. Benioff also stated that the important part of her return to Winterfell is her relationship with Sansa Stark, with Weiss following up by stating that the intention of the scene in the crypts where they are reunited was to "lay down the beginnings of the storyline where Sansa realizes what Arya is now." Speaking about the revelation of the cave drawings with the Children of the Forest and the First Men, Benioff stated that the inspiration for the drawings were the cave paintings created by prehistoric men that were found in France, and that the scene was meant to be evocative in noting the thousands of years that have passed since the drawings were created. In writing the battle between the Lannister army, and Daenerys' Dothraki and Drogon, Weiss stated that one of the most exciting elements of the fight involved the fact that two main characters were on opposite sides of the battlefield, and that it is "impossible to really want any one of them to win, and impossible to want any one of them to lose," according to Weiss. He also compared the introduction of a dragon in medieval warfare to using an F-16 fighter aircraft in a medieval battle. According to Nikolaj Coster-Waldau, in an interview with Entertainment Weekly following the airing of the episode, the script stated that "One of our main characters is about to die." 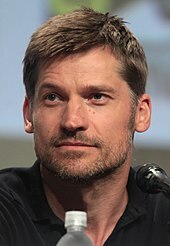 Coster-Waldau also stated about his character, "Jaime is such an idiot that he thinks for a second, 'If I can do this, I can win the whole thing in a 'Hail Mary.'" In addition to the regular recurring guest cast, Major League Baseball player Noah Syndergaard, pitcher for the New York Mets, made a brief uncredited cameo appearance as a spear-throwing Lannister soldier during the battle between Lannister and Tarly forces and Daenerys Targaryen and the Dothraki. In an interview prior to the season conducted by Sports Illustrated, Syndergaard spoke about his appearance in the series by saying "It's a dream come true. I think it’s the greatest TV show of all time, so just to be able to say I was in Game of Thrones is an unbelievable feeling." "The Spoils of War" was directed by Matt Shakman. This was Shakman's first episode of Game of Thrones, but he had previously served as a director for several other television series, including Fargo, The Good Wife, Mad Men and It's Always Sunny in Philadelphia, among others. The battle sequence at the conclusion of the episode, which was nicknamed "The Loot Train Attack" by HBO, set an industry record for the most stuntmen set on fire, with real fire being used, rather than special effects, to simulate the dragon fire being emitted by Drogon. There were 73 "fire burns," in addition to 20 people being set on fire for a single shot. Filming of the attack sequence took approximately 18 main-unit days, five second-unit days, and several weeks for the effects-unit. In an interview with The Hollywood Reporter, Shakman spoke about the first time he read the script of the battle, saying "I was reading the script and this battle began and I kept turning pages and the battle kept going on page after page after page! The excitement, the stress and the fear all built at the same time, mirroring probably what was happening on screen. It was a huge opportunity and a challenge. I spent the better part of six months working on that one sequence." The "Loot Train Attack" was filmed in Cáceres, Spain, and Emilia Clarke, who portrays Daenerys Targaryen, was filmed riding a motion base on a stage in Belfast in front of several green screens. Director Matt Shakman chose Jaime Lannister, portrayed by Nikolaj Coster-Waldau (pictured), as the main point of view for the battle. Shakman's first step in directing the battle was choosing to focus on a specific perspective, with Shakman choosing Jaime as the main point of view, noting "To see it from a traditional fighter like Jaime to see what happens when you introduce something like napalm or the atom bomb into battle and all the sudden traditional fighting goes out the window." Shakman also noted that Tyrion was another important perspective for the battle, as he watches from afar, saying "We talked through every beat of what he was seeing, and then he imagined that in his mind and brought it to life. He's the human intermediary there to see the battle through." Shakman filmed Peter Dinklage as Tyrion about a mile from the battlefield, and most of his shots involved "staring at lots of different tennis balls" for eye line. Shakman drew inspiration for the direction of the sequence from Miguel Sapochnik, who directed the sixth season episode "Battle of the Bastards", and Neil Marshall, who directed the second season episode "Blackwater", as well as the battles in Apocalypse Now, Saving Private Ryan and Stagecoach. Shakman also revealed that he used the volcanic destruction of Pompeii as a reference, which led to the idea of some of the army being turned to ash. For the beginning of the "Loot Train Attack," with the Dothraki approaching, Shakman stated that he wanted it to feel like a Western, saying in the interview, "I wanted that feeling of a Western — this savage attack coming at this more formalized line of men, that tension of circling the wagons and trying to protect them from the chaos and the onslaught." Shakman worked with the horse mistress, Camilla Naprous, in order to show the Dothraki's mastery at horse riding, which included standing on the horse's saddles while shooting arrows. In order to accomplish this stunt, Naprous built what was referred to as a "metal shoe" that allowed the stunt performers to stand on the horses. The sequence continues with Drogon attacking the Lannister and Tarly armies, with special effects supervisor Joe Bauer noting that the number of shots of Emilia Clarke as Daenerys Targaryen riding Drogon increased significantly, with the entirety of the sixth season having eleven shots, while "The Spoils of War" alone had over 80 shots. As the stunt performers were lit on fire, they were required to hold their breath until the fire was put out, and specific attention was given to stunt performers in the middle of the shot, as they faced the brunt of the heat from the fire. Shakman also spoke about the difficulty in shooting the dragon sequence and the safety of the performers, saying "The most difficult was safety because you're dealing with fire, horses and actors — and those things don't do well in close proximity yet the nature of it was to create this Bosch-like nightmare where, as the scene progresses, it becomes increasingly like you're in the pit of hell. That was difficult." Robert McLachlan who served as cinematographer for the episode, and previously was cinematographer for episodes including "The Rains of Castamere" and "The Dance of Dragons" in the show's third and fifth seasons respectively, was also interviewed about the process of creating the "Loot Train Attack." In an interview conducted by The Verge, McLachlan revealed that the production team received the script for the episode more than a year in advance. Several cameras were used to capture the "Loot Train Attack," including a small handheld camera known as an Osmo, which "allowed a horseman to get shots while riding a horse at a full gallop through the cavalry charge," as well as a "custom-built miniature helicopter drone" for the "overhead dragon shots." A cable-cam was also used, which made several passes over the battlefield during the course of filming. Going into filming, one of McLachlan's most desired effects was the amount of smoke on the battlefield, saying "we wanted to block the sun out so the shots would have some consistency. And I knew the fire and smoke would be incredibly beautiful." White smoke was used towards the beginning of filming, but as the battle went on, McLachlan decided to switch to black smoke, which was accomplished through burning diesel oil. This caused the crew to be required to wear masks and goggles, and raised concern for HBO's safety officer, who eventually prohibited further use of the black smoke due to health and safety concerns. Additional smoke was added later by the special effects team. The number of extras that were utilized for filming the "Loot Train Attack" began with more than 600 extras, and gradually decreased as the weeks of filming went on, with 400 extras returning the following week, and ultimately concluded with approximately 100 extras, according to McLachlan. McLachlan also discussed the "oner" featuring Bronn, which he described as a single shot that "runs for as long as possible," revealing that the sequence was actually three shots that were stitched together by the special effects team, led by VFX supervisor Joe Bauer. He continued by revealing that the entire "oner" Bronn sequence was accomplished in only three takes. In an interview with Entertainment Weekly, Sophie Turner, who portrays Sansa Stark, spoke about filming the reunion scene with Maisie Williams, who portrays Arya Stark. Turner stated that the two kept laughing during the filming of the scene, and that they couldn't "keep a straight face". She continued, "Our relationship is so close, but it's only that fun side, never the business side. I was nervous. It just terrified me. It's like performing for your mum. When somebody is watching you don't do it quite as well." Williams also spoke about the scene, saying, "It was the weirdest thing when we shot our first scene together. We were both embarrassed to do our thing in front of each other. It took a few hours for us to get serious and actually do it. Later it was fine on set and we could concentrate, but it was so hard to get into character with Sophie in front of me." Shakman also spoke about the reunion in a separate interview, saying, "It was fun for them, it was fun for us to see them work together, and same with Isaac when they all got together. They're all terrific, and they're amazing actors, and it was fun to see them come together now as adults and navigate these much more complicated scenes than they had to do with each other years ago." "The Spoils of War" was viewed by 10.17 million total viewers on its initial viewing on HBO, which was significantly higher than the previous week's rating of 9.25 million for the episode "The Queen's Justice". This set a ratings record for Game of Thrones, as the highest rated episode of the series to that point, surpassing the seventh season premiere, which previously held the record. The episode also acquired a 4.6 rating in the 18–49 demographic, making it the highest rated show on cable television of the night. In the United Kingdom, the episode was viewed by 3.015 million viewers on Sky Atlantic, making it the highest-rated broadcast that week on its channel. It also received 1.022 million timeshift viewers. "The Spoils of War" received widespread acclaim from critics, who listed the battle between Daenerys Targaryen and Jaime Lannister, Arya's return to Winterfell and interaction with Brienne, and Daenerys and Jon Snow's conversation at Dragonstone as high points of the episode. It has received a 97% rating on the review aggregator website Rotten Tomatoes from 43 reviews with an average score of 9.2 out of 10. The site's consensus reads "'The Spoils of War' delivers arguably the greatest battle sequence of the series so far, in exciting, epic, fiery spectacle." The episode also currently holds a 9.8 out of 10 community rating on IMDb, making it one of the highest-rated episodes on the website. Matt Fowler of IGN wrote in his review for the episode, "The past three Thrones episodes now have ended with big action set pieces, but the Dragon/Dothraki battle down in The Reach, in "The Spoils of War," was one of the most gripping and magnificent ones to date. It may even rival "Hardhome" in terms of spectacle." He continued, "Game of Thrones pulled no punches and showed no quarter this week as we witnessed one of the fiercest and most engaging battles the show's ever produced, featuring major fan-favorite characters on opposite sides of the fight. On top of that, Arya, after seven years, made her way home to Winterfell and managed to best Brienne of Tarth in a friendly training session. There are three Starks in Winterfell right now, but with Littlefinger there poisoning the well, things still aren't quite right." He gave the episode a 10 out of 10. Myles McNutt of The A.V. Club similarly praised the concluding battle sequence: "The Spoils Of War" lives up to its title by reinforcing how much more fruitful war is as a storytelling mechanism at this point in the series' life." He also compared the episode to the previous episode, "The Queen's Justice", which had two battles that largely took place off-screen, writing "Here, the battle is told through multiple perspectives, each vested with meaning and purpose: our point-of-view shifts between Dany and Drogon and Jaime and Bronn, before eventually adding Tyrion watching from afar, and the direction from first-time Thrones director Matt Shakman uses those POV very carefully." He concluded his review by saying "The Spoils Of War" anchors itself on characters whose stories are far from over, and crafts a reunion and a battle sequence that end no stories and yet draw meaning from the fact that technically, at this point, any story could end at any moment." He gave the episode an A-. James Hibberd of Entertainment Weekly gave the episode an A, writing in his review, "All the leaks in the world couldn't wreck 'The Spoils of War'. Game of Thrones' shortest episode ever — and part of the show's fastest-paced season ever — didn’t feel rushed at all, and the story's impact remained incredibly strong no matter what you knew ahead of time." On August 4, 2017, it was reported that, two days before its original broadcast, the episode was leaked online from Star India, one of HBO's international network partners. Four suspects were arrested over the leak in Mumbai. Three of them were current employees of Prime Focus Technologies, an independent company that handles Star India's data, while one was a former employee. ^ "'Game of Thrones' just pulled off one of its greatest episodes in the shortest amount of time". Business Insider. Retrieved August 8, 2017. Despite being a record-short time of just 50 minutes, "Spoils of War" might go down in history as one of the greatest episodes of HBO'S "Game of Thrones." ^ "Best TV Episode". IGN. ^ Hibberd, James (August 3, 2017). "Game of Thrones: Sunday's episode will be its shortest ever". Entertainment Weekly. Retrieved August 7, 2017. ^ a b c "Game of Thrones: Inside Sn 7 / Ep 4". HBO. August 6, 2017. Retrieved August 6, 2017. ^ Wigler, Josh (August 7, 2017). "'Game of Thrones' Showrunners Reveal Dark Side of That Emotional Reunion". The Hollywood Reporter. Retrieved August 7, 2017. ^ Prudom, Laura (August 6, 2017). "Should we be worried about Jaime after that 'Game of Thrones' cliffhanger?". Mashable. Retrieved August 7, 2017. ^ a b Hibberd, James (August 6, 2017). "Game of Thrones: Nikolaj Coster-Waldau on Jaime's uncertain fate". Entertainment Weekly. Retrieved August 6, 2017. ^ a b Rosen, Christopher (August 6, 2017). "Game of Thrones: Noah Syndergaard cameo revealed". Entertainment Weekly. Retrieved August 7, 2017. ^ Robinson, Joanna (June 29, 2016). "The Best Director on Game of Thrones Won't Be Coming Back Next Year". Vanity Fair. Retrieved August 7, 2017. ^ a b c d Woerner, Meredith (August 7, 2017). "All the details behind that 'Game of Thrones' insane dragon assault in 'The Loot Train Attack'". Los Angeles Times. Retrieved August 7, 2017. ^ a b Holloway, Daniel (August 7, 2017). "'Game of Thrones' Director: Loot Train Battle Inspired by Atom Bomb, Pompei". Variety. Retrieved August 8, 2017. ^ a b c d e f Wigler, Josh (August 7, 2017). "'Game of Thrones' Director on "Dealing Death From the Sky" in Stunning Dragon Scene". The Hollywood Reporter. Retrieved August 7, 2017. ^ a b Schwartz, Terri (August 7, 2017). "Game of Thrones "Spoils of War" Director on Jon and Daenerys Romance and That Ending". IGN. Retrieved August 7, 2017. ^ a b Robinson, Tasha (August 11, 2017). "Game of Thrones' cinematographer breaks down the 'dragon-induced Armageddon' in The Spoils of War". The Verge. Retrieved August 11, 2017. ^ Hibberd, James (August 6, 2017). "Game of Thrones stars on that emotional 'Spoils of War' reunion". Entertainment Weekly. Retrieved August 6, 2017. ^ a b Porter, Rick (August 8, 2017). "Sunday cable ratings: 'Sharknado 5' lacks bite, 'Game of Thrones' hits total-viewer high". TV by the Numbers. Retrieved August 8, 2017. ^ Porter, Rick (August 1, 2017). "Sunday cable ratings: 'Rick & Morty' returns strong, more highs for 'Insecure' and 'Ballers'". TV by the Numbers. Retrieved August 1, 2017. ^ Makuch, Eddie (August 8, 2017). "Despite Leaking Early, The New Game Of Thrones Episode Set A Ratings Record". GameSpot. Retrieved August 8, 2017. ^ "Top 10 Ratings (31 July - 6 August)". BARB. Retrieved August 18, 2017. ^ a b Hibberd, James (August 6, 2017). "Game of Thrones recap: 'The Spoils of War'". Entertainment Weekly. Retrieved August 6, 2017. ^ a b Fowler, Matt (August 7, 2017). "Game of Thrones: "The Spoils of War" Review". IGN. Retrieved August 6, 2017. ^ "'The Spoils of War' Game of Thrones: Season 7, Episode 4". Rotten Tomatoes. Retrieved September 2, 2017. ^ ""Game of Thrones" The Spoils of War (TV Episode 2017)". IMDb. Retrieved 2017-08-07. ^ McNutt, Myles (August 6, 2017). "Game Of Thrones has us wondering how long each character's story will last". The A.V. Club. Retrieved August 6, 2017. ^ Tapley, Kristopher. "'Blade Runner,' 'Mudbound,' 'Game of Thrones' Land ASC Cinematography Nominations". Variety. Retrieved January 9, 2018. ^ "Best of 2017". IGN. ^ "HPA Awards: 'Dunkirk' Wins Best Editing in a Feature". The Hollywood Reporter. November 16, 2017. Retrieved February 14, 2018. ^ "DGA Announces Nominees for Outstanding Directorial Achievement in Television, Commercials and Documentary for 2017". Directors Guild of America. 2018-01-10. Retrieved 2018-01-10. ^ Giardina, Carolyn (February 13, 2018). "Visual Effects Society Awards: 'War for the Planet of the Apes' Wins Big". The Hollywood Reporter. Retrieved February 14, 2018. ^ Giardina, Carolyn (February 18, 2018). "Golden Reel Awards: Oscar Nominees 'Blade Runner 2049,' 'Dunkirk' Among Sound Editor Winners". The Hollywood Reporter. Retrieved February 19, 2018. ^ Montgomery, Daniel (September 6, 2018). "2018 Gold Derby TV Awards winners: 'Versace' and 'Handmaid's Tale' are top winners, but 'Game of Thrones' takes Best Drama". Gold Derby. Retrieved September 18, 2018. ^ "2018 Emmy Awards Nominations" (PDF). Academy of Television Arts & Sciences. Retrieved July 12, 2018. ^ Hibberd, James (August 4, 2017). "Game of Thrones episode 4 leaks online". Entertainment Weekly. Retrieved August 4, 2017. ^ Iyenagar, Rishi (August 15, 2017). "Four men arrested in India over 'Game of Thrones' leak". CNNMoney. Retrieved August 17, 2017. This page was last edited on 21 April 2019, at 15:53 (UTC).